My Big Book of Vegetables - An excellent book incorporating beautiful images in vibrant colours with simple to read text that encourages children to learn about animals. 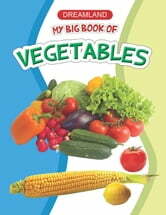 More than 65 vegetables are mentioned in this book. This book is a part of big book series having 15 books on different topics.